As Eastern Caribbean Islands, the U.S. Virgin Islands (USVI)—made up of St. Croix, St. Thomas, and St. John—are quite vulnerable to hurricanes. So, before you plan your next getaway to the USVI, make sure to consider the hurricane season by checking with local weather experts. Based on historical weather records dating back to 1950, the Atlantic region will typically experience 12 tropical storms with sustained winds of 39 mph, of which six turn into hurricanes with winds reaching 74 mph or greater, and three major hurricanes category 3 or higher with sustained winds of at least 111 mph. It's important to note that most of these hurricanes do not make landfall in the U.S. Virgin Islands. How Often Do Hurricanes Hit the USVI? A hurricane passes near the U.S. Virgin Islands, on average, every three years. A hurricane makes a direct hit on the islands, on average, every eight years. 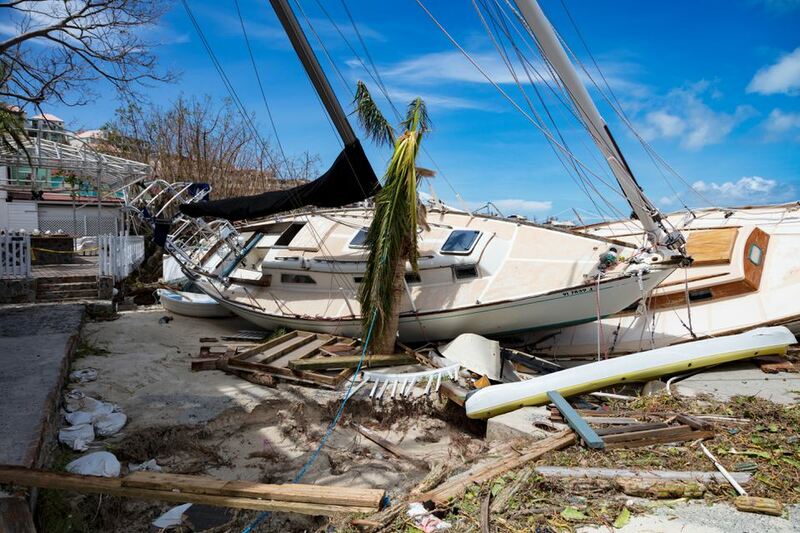 The Virgin Islands suffered a direct hit by category 5 Hurricane Irma in September 2017. It was one of the worst Atlantic hurricane seasons on record. Prior to that, the last major hurricanes to land on the islands were category 3 Hurricane Marilyn in 1995 and category 4 Hurricane Hugo in 1989. Other hurricanes, such as category 1 Hurricane Otto in 2010, have been less strong but still caused great damage. Statistically, the chances of a hurricane or tropical storm hitting the islands during your visit are very slim. However, three out of four hurricanes and tropical storms occur between August and October, with storm activity peaking in early to mid-September. If you're planning to vacation in the USVI during hurricane season, and especially during the peak period, you might want to consider buying travel insurance. Typically, if your trip is canceled or interrupted due to a storm, you can be refunded up to the limit of coverage. Note that in most cases, insurance must be purchased more than 24 hours before a hurricane is named. Also, most hotels and airlines will offer refunds or a rescheduled itinerary if a hurricane interrupts your planned vacation. The 2017 Atlantic hurricane season was a wildly active and destructive season that ranked among the most ferocious since records began in 1851. There were a total of 17 named storms, 10 hurricanes, and six major hurricanes. Worse yet, the season was relentless, with all 10 of the season's hurricanes occurring consecutively. In September, the Virgin Islands suffered a direct hit by category 5 Hurricane Irma, however, by summer 2018, cruise ships and hotels have reopened and resumed service.